This morning we loaded up and headed for Wannamaker Dog Park. And man did we luck out, got to meet two really cool labs. 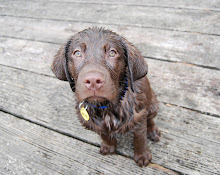 This is Cocoa, a 4 month old chocolate lab baby girl. She had no fear of running with the big dogs and loved to splash in the water bowl. Cocoa did not like having her picture taken, but the lab paparazzi was determined to get a photo of her interacting with her older male doppelganger Zeke. Then we met Doug the black lab, who was from Lowcountry Lab Rescue just like Sadie. But how he found his mom was such a great story: he was at the beach with his foster and got free and ran right up to this stranger, his foster parent came up apologized and asked if she wanted to adopt him. They got the opportunity to play some more and every time Doug got called back he came straight to her and sat at her feet. So he new who needed to be his new mom! We just had to get an alumni shot to post on the LLR facebook page.